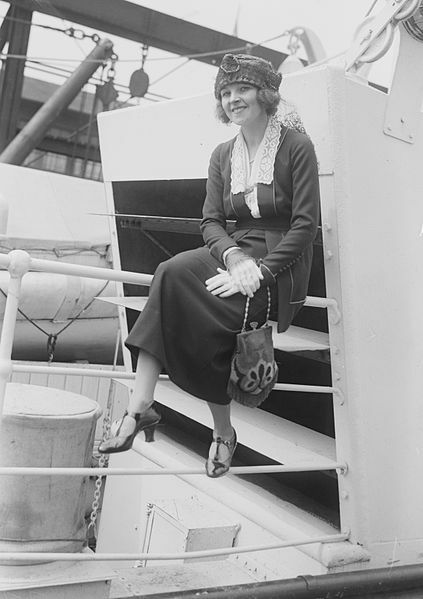 Shoe design in the 1920s departed somewhat from the high button boots and jet embroidered slippers prevalent in previous decades As hemlines rose, shoes became more prominent and thus there was more to show off. Ankle straps with side buttons and T-bars were among the popular styles of the era. Heels were generally quite high. - 2 inch or 21 and 1/2 inch curved or block. Some shoe styles lent themselves to decoration with sequins, clasps and diamantes, particularly for evening wear. Toes tended to be gently pointed and arches high and beautifully shaped to flatter the foot, though towards the end of the decade more rounded toes and flatter heels were coming into vogue. Contrasting coloured heels, decorated with patterns or even rhinestones were also fashionable, as were satin pumps, decorated with clasps, beads and sequins. Popular colours of the period included bronze, black, silver, gold, navy, green and various pastels. 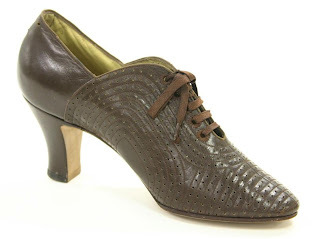 1920s brown "Semi-Oxford" Paragon shoe. Image from the Melbourne Museum website. 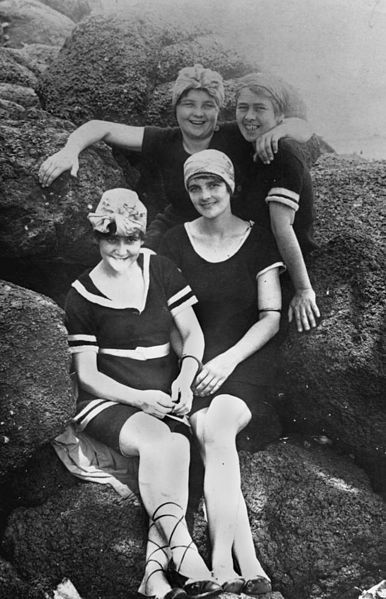 The three basic styles of pumps, ankle straps and T bars were closed toe and were worn throughout the decade; it wasn't until the 1930s that open toed shoes made a mainstream appearance. For casual wear, women wore lower heeled Mary Janes, Oxford brogues or button up boots styles. Heel decorations were sometimes very elaborate, especially in the high fashion stratosphere of Paris - there's some wonderful sketch examples of 1920s exquisitely detailed heel work, revealed in a Parisian trade catalogue at rarefashionbooks, which you can view here. The influence of 1920s shoe designers is still evident in many of the shoes of today - classic styles that remain eternally elegant, defying trends which come and go with the decades.